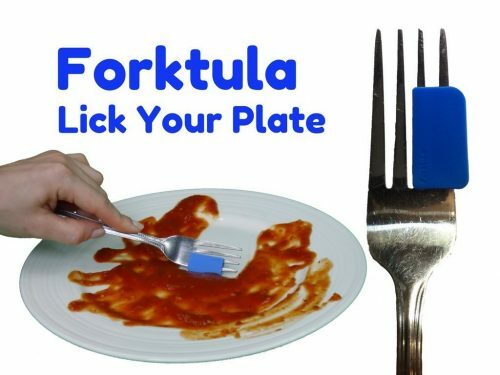 Forktula – A New Way to Lick Your Plate Clean! This small silicone spatula for your fork will entertain guests, engage kids, and create a whole new way to enjoy a meal around your dinner table. Now you can lick your plate in public. The Forktula slides onto the two outer prongs of any standard fork, allowing you to scrape, swipe, wipe, and squeegee your plate clean! It’s also a great tool for cleaning out jars, baking, and plating unique dishes.